LeanIX, in collaboration with "Rethink! 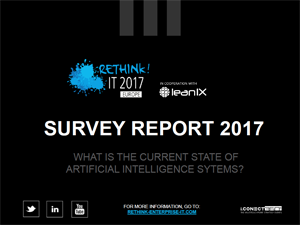 IT Europe ", the leading IT event across Europe, published a study on the use of Artificial Intelligence. Over 140 high-ranking CIOs and IT decision-makers from leading European companies participated in the survey. Find out how Artificial Intelligence (AI) is already being adapted and applied in everyday practice, whether companies are planning the introduction of AI and what obstacles must be overcome during implementation. Just fill in the form to receive the complete survey results.